My wife has the flu. So last night she suggested I may want to sleep in the guest bedroom. “The only thing is,” she explained, “you’ll need to put sheets on the bed.” She then drew me a map as to where to find the sheets in the hall closet, took some NyQuil, and went to sleep. Soon after I found myself standing beside the guest bed trying to determine how to put the sheet with the curved elastic corners onto the mattress. “I have a college degree,” I said to myself trying to figure out which side of the sheet was the length and which side was the width. I managed to get one curvy corner over one side of the mattress on the foot of the bed and then stretched the other curvy corner to the top of the bed only to have the bottom side pop off. Undeterred, I put the top side on and then stretched it down to the bottom only to have the top side pop off. “I must be using the wrong side,” I told myself. So using my suspect math skills, I spun the sheet by a quarter and tried again. Same thing. I stared at the sheet looking for instructions or at least arrows pointing in the direction the sheet is supposed to go. Talk about a manufacturing oversight. I spun that lousy piece of sheet on the bed at least 15 different times trying to find the right configuration but the closest I ever came was to get three corners. That’s when it occurred to me I must be using the wrong sized sheet. I followed my map back to the closet, pulled out a new sheet with elastic corners and tried again. This time, I managed to get all four corners of the sheet onto the mattress even though the elastic corners were desperately searching for some crevice they could cling to. When I laid down, everything seemed to work when suddenly, all four corners simultaneously popped off and enveloped me like a giant cocoon. I was laying in my white cocoon considering checking into a nearby hotel, when I realized I didn’t care if the lousy bed sheet was on correctly or not. After all, I spent my entire freshman year of college without bedsheets and was certain I could manage until my wife got over the flu. Besides, the cocoon was perfectly comfortable and even eliminated my need to use the other sheet in the set – the one without the elastic corners. Engulfed in my soft cocoon, I started thinking that perhaps I had stumbled onto something that would be perfect for the “As Seen On TV” section at Walgreens. “Why pay for two sheets when all you need is one?” would be my slogan. Then, in my very expensive Super Bowl ads, you’d see happy people jumping into their beds in slow motion only to be lusciously swallowed up in fluffy white cocoons of cotton on top of bare mattress pads. I must admit it was rather gratifying knowing I could help millions of men who would never get their elastic cornered sheets to stay on without staple guns. 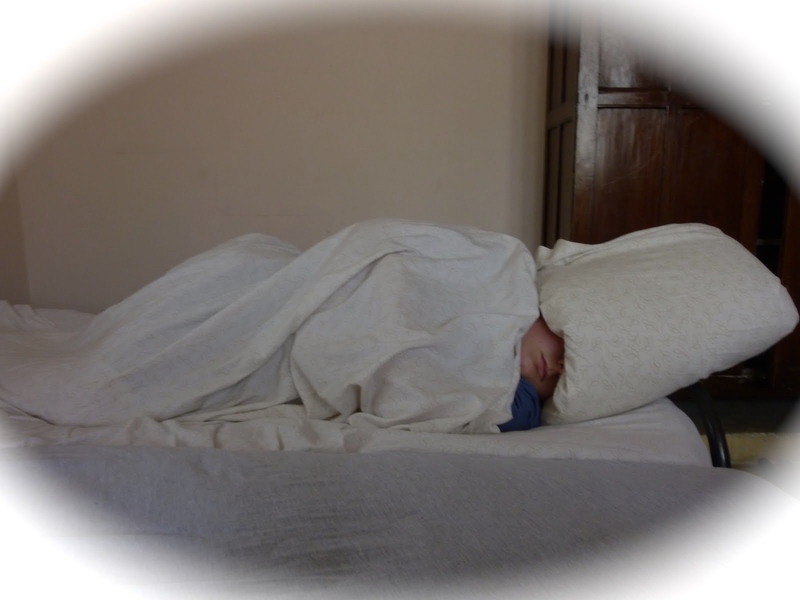 With that happy thought, I pulled a pillow into my cocoon, drew a soft blanket over the top, and fell asleep. Solving problems for millions of men, after all, is exhausting.